Why, oh why, would anyone get excited about address labels? Yes, you have to put a return address on your mail and, yes, address labels can save you lots of time if you are sending lots and lots of mail…like during Christmas card season. But if all you can think about is the functionality, you are missing all the fun. First impressions count. And when your friends and relatives get your holiday card in the mail, how will they know it’s not a bill, or junk mail, or a card from the realtor down the street? Because it has that festive, colorful, personalized address label on it, of course! It will make them smile and get excited to see the matching card inside, we guarantee it. Another reason we’re giddy about address labels is how much fun they are to stick on things. Even a kid can do it. One of our favorite address label ideas is to get the kids involved in the Christmas card assembly process. Address labels and stamps are their department. You are the supervisor. Pour yourself a glass of wine and watch. It will be fun. We guarantee it. 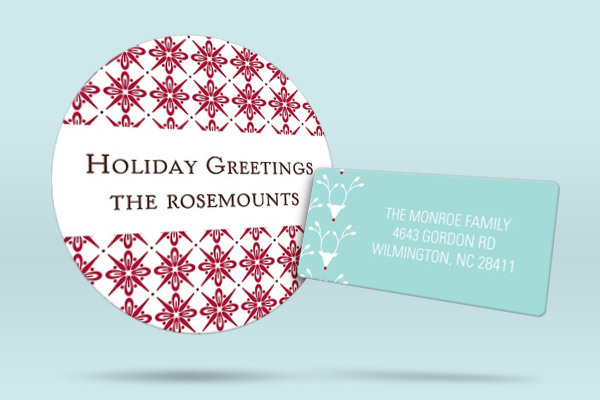 Check and see if your Christmas cards have matching address labels available. And for more ways to make addressing your Christmas cards easier and more fun, check out our blog.